Brown is definitely an under-used color, and I for one had long been looking for a brown flannel suit for the colder seasons. I never really found one I liked or that fit me, so having one made from the fabric I liked made sense. Again, I turned to Helsinki's sartorial gem, Vaatturiliike Sauma on Bulevardi, picked my fabric and started the wait. Here's how it turned out. So, as with my other made-to-order pieces, this particular suit is fully-canvassed and without any padding. It has the usual bells and whistles like the pick stitching all around and the trousers are without belt loops. The fabric is from Ariston and the weight of it is 280g per square meter. 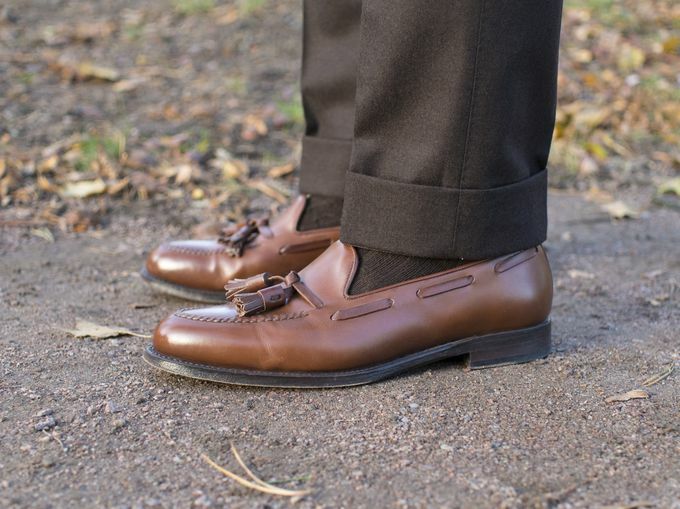 The brown is a sort of dark semi warm brown and the texture has some roughness to it while still looking fairly formal. 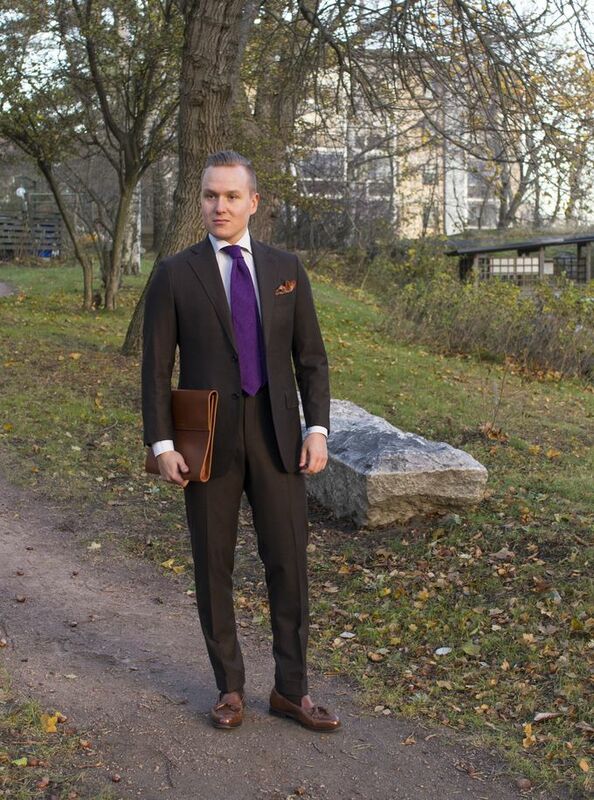 All in all, it is a great and fairly subtle suit to be worn in pretty much any kind of work situation. 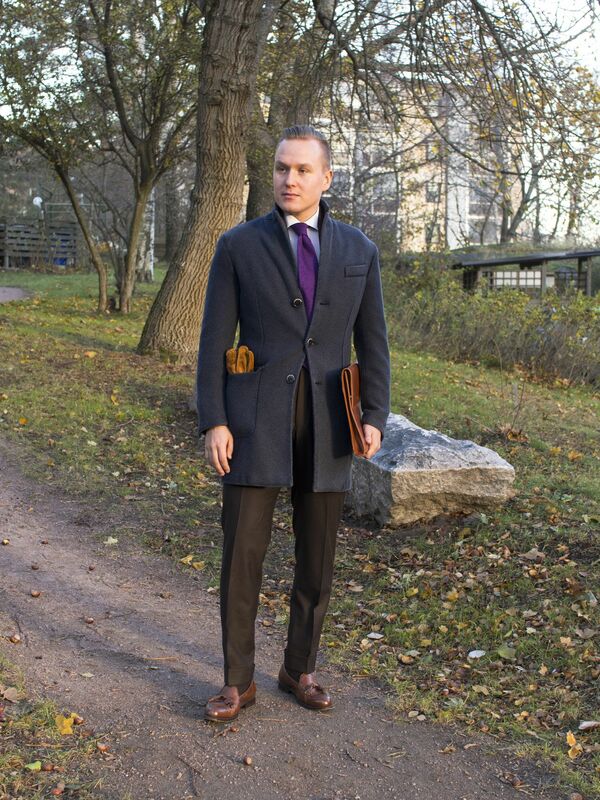 The other items worn here include a LBM 1911 wool coat, SuitSupply shirt, Exquisite Trimmings shantung silk tie, Drake's London wool silk pocket square, SuitSupply braces, Berg & Berg portfolio, Berg & Berg wool flannel socks, Septieme Largeur tassel loafers and snuff suede gloves. 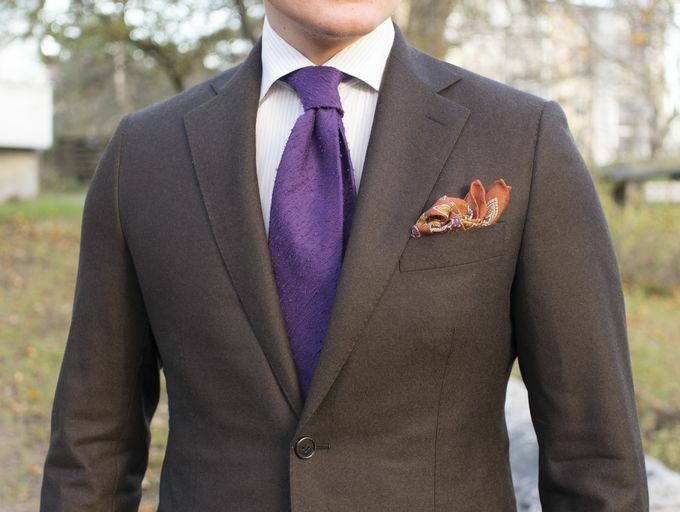 Something I've always liked quite a bit was to combine brown and purple. Here, I've also thrown in some orange for the seasonal vibe. 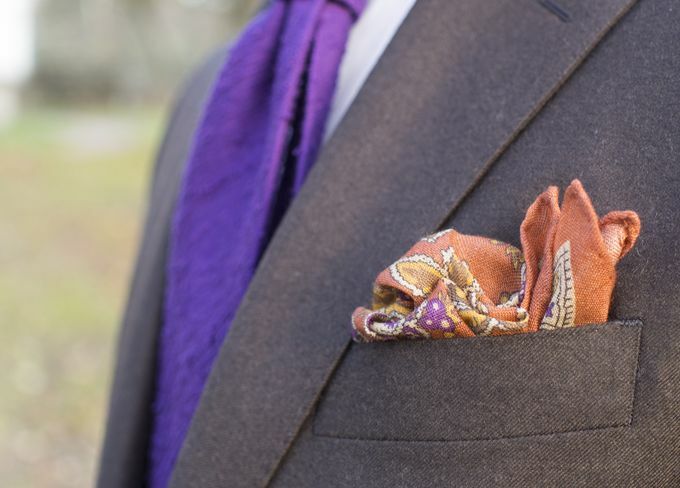 Something I often do - pick my pocket square so its secondary color goes well with my tie. In this case we're playing with purple of course, but I also quite like how the orange compliments the tan shoes, portfolio and the snuff suede gloves. And my tan SL loafers. Too bad it seems we finally got our permanent snow here in Helsinki a few days ago so it seems like the loafer season is finally over.